Pack of 100 Certificates - Hammersley Holdings Limited Australia- Price includes shipping costs to U.S.
Home > Certificate Quantities for Educators / Business Promotions > Pack of 100 Certificates - Hammersley Holdings Limited Australia- Price includes shipping costs to U.S. 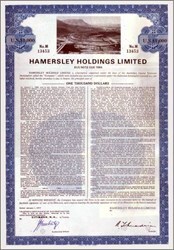 Beautifully engraved $1000 Bond Certificate from the Hammersley Holdings Limited. This historic document was printed by the American Banknote Company and has an ornate border around it with a vignette of a factory. This item has the printed signature of the Company’s Director. amersley Holdings Limited was formed in association with the Kaiser Steel Corporation of the United States, and in August 1979 has CRA acquired the Kaiser shareholding. A huge open-cut mine was established with mechanical mining and loading facilities, and a railway was constructed to Dampier, 290 kilometres northwest of Mt Tom Price, where a port and loading facilities were provided. Townships were built at the mine and at the port (and later at Paraburdoo,100 kilometres south of Mt Tom Price). This was a tremendous achievement requiring close co-ordination. The first shipments were made in 1966, and 23 million tons were produced during 1971. The mine at Paraburdoo began producing in 1973.